Strawberries may be small, but don’t doubt their ability to provide great benefits to your skin. Here in Tennessee, we’re getting closer and closer to strawberry season. This excites me for a number of reasons, not the least of which is homemade strawberry shortcake. 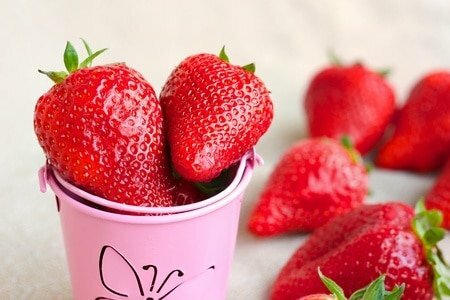 I love the taste of fresh strawberries, and I enjoy cooking, baking, and preparing jelly and jam with them. Nothing says “summer is on the way” to me more than those beautifully ripened red berries all piled up in a basket. But as an esthetician, I have some other reasons to be fond of strawberries. They truly are a natural bounty of antioxidants and nutrients that are especially useful for those who are interested in healthy skin. Strawberries are rich in antioxidants. In fact, they’re so full of antioxidants that they rank as the 3rd best source of antioxidants per serving of all commonly consumed US foods! Wow! Now, what do antioxidants do for skin? The short answer is that they limit the production of free radicals, and free radicals are the monstrous little molecules responsible for most all the damage to our bodies – including our skin. Yes, free radical damage is at the heart of fine lines, wrinkles, pigmentation problems, inflammation and redness, and the breakdown of our precious collagen and elastin fibers. Antioxidants, like those found in the Strawberry, effectively reduce the formation of free radicals and thereby slow down the aging process – even in our skin. Vitamin C, one of your skin’s most needed vitamins, is also found in Strawberries. As we often like to say in the beauty industry, “Vitamin C brightens, lightens, and tightens“. That is a big reduction in the real science behind Vitamin C, but I don’t want to bore you to tears with chat about physiology and cosmetic chemistry, so we’ll stick with that catch phrase. Vitamin C is directly involved in the production and health of all your important skin cells – again, think collagen and elastin. It is one of the top warriors against the signs of aging, and I am of the school of thought that says “No matter the age or the condition – women looking to improve their skin should be getting topical and nutritional Vitamin C.” When it comes to fresh strawberries, do note that the antioxidant and Vitamin C levels in freshly picked strawberries diminish quickly. So try to scarf down those berries in just a few days to get the fullest benefit of their nutrients. Strawberries have a host of other skin and health benefits. In fact, I would never be able to list them all in a single blog post, but I would like to mention that they are also anti-fungal, anti-inflammatory, immune boosting, and somewhat astringent. All of these factors add up to give us one tiny little fruit that means big business when it comes to health (and healthy skin). The average strawberry has over 200 seeds! By the way, those little seeds make a great addition to face scrubs. The average American consumes 3.4 pounds of strawberries each year. With all the benefits we looked at above, we should try to beat that average this year for sure! With all these details – what’s not to love? 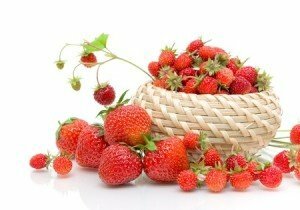 Strawberries – eat them, enjoy them, and your skin will love you for it!